At some time in your business life, someone will probably owe you money. You have run through the collections process and you still haven't received payment. You may decide that the only way to get this money is to take the person to small claims court. 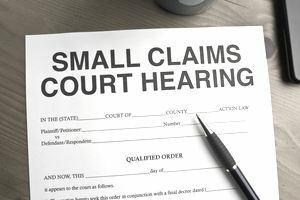 Small claims courts are a specific kind of court that hears cases between two parties without the need for lengthy and expensive lawsuits. You can take a case to a small claims court without the expense of an attorney. But going to small claims court means you must file your case and defend it by yourself. It's made to be an easy process, but that doesn't mean you shouldn't prepare carefully. Before you take the step of filing a small claims case against someone, consider this: The small claims process works best in circumstances where the debtor is local and easily contacted. But these are also people you may want to do business with in the future. You should also consider carefully whether you want to do business with this person or company in the future. Taking someone to court, even small claims court, means you are probably severing the relationship. You may want to consider other alternatives to small claims court. The process of taking someone to small claims court is designed to be easy for anyone and to avoid having to pay attorney fees. It is possible for you to file the paperwork and receive a judgment for little cost in terms of money and time. You can only use small claims court if the debt is below a specific amount. The small claims limit is determined by your state. Each state has small claims court limits. The small claims process begins when you file a complaint with your county. You can get the paperwork and fill out the necessary forms yourself. You will need to pay for the filing and also for an officer of the court to serve a summons on the other party in the case. The court then sets a date for the case to be heard in small claims court. Preparing your case means gathering documents you need to prove (a) that you did the work or delivered the product the customer ordered and (b) that the customer did not pay. You may also want to bring proof that you attempted to collect this money by other means before resorting to small claims court. Come to the court at the appointed day and time to present your case. Be sure to bring all the documentation that shows that you did the work or sold the product to the customer, including any agreements, invoices, or sales receipts signed by the customer. If you have the proper documents, the court will usually award you the judgment (the decision of the court) unless there is some compelling reason why the defendant should not have to pay. The judgment means that the court is ordering the customer to pay you the amount that is due. Just because the court has awarded you the judgment, it doesn't mean that the person will pay. Success in small claims court means that you successfully collect the money that is due to you. To do that, you may have to go back to court to get a lien on the person's property or to order a wage garnishment. The small claims process is fairly simple, but you must do the work to set up the claim and pursue payment through the court.